The book supplements Guidelines for Chemical Process Quantitative Risk Analysis by providing the failure rate data needed to perform a chemical process quantitative risk analysis. The CENTER FOR CHEMICAL PROCESS SAFETY (CCPS), an industry technology alliance of the American Institute of Chemical Engineers (AIChE), has been a world leader in developing and disseminatinginformation on process safety management and technology since 1985. 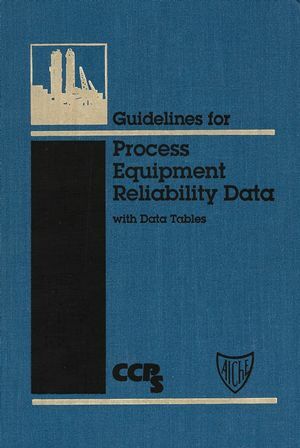 CCPS has published over 80 books in its process safety guidelines and process safety concepts series. For more information, visit www.ccpsonline.org. 1.2 Guidelines Purpose, Scope and Organization. 1.3 Use of This Guidelines. 2. Equipment Failure Rate Data. 2.1 Sources and Types of Failure Rate Data. 2.5 Sources of Variation in Failure Rates. 2.6 Time-Related and Demand-Related Failure Causes. 2.7 Using Failure Rate Data. 3.3 The CCPS Taxonomy and Its Use. 4. Data Bases, Sources, and Studies. 4.3 Process Equipment Data Bases. 4.4 Process Equipment Data Sources. 4.5 Chemical Process Quantitative Risk Assessments (CPQRAs). 4.6 Nonprocess Equipment Data Bases. 4.7 Nonprocess Equipment Data Sources. 4.8 Probabilistic Risk Assessment (PRAs). 5. CCPS Generic Failure Rate Data Base. 5.4 Use of the CCPS Generic Failure Rate Data Base. 5.5 CCPS Generic Data Tables. 6. Collection and Conversion of Plant-Specific Data. 6.3 Data Review and Qualification. 7. Failure Rate Data Transfer. Appendix A. CCPS Generic Failure Rate Data Base Taxonomy. Appendix C. Matrix of Data Elements in Data Resources. Appendix D. Unreviewed Data Bases, Data Sources, and Studies.